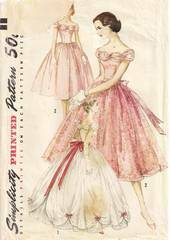 Dress has strapless, boned bodice to which soft, gathered trim is tacked. Skirt is gathered. Full overskirt is gathered to band and has tie ends. View 1 features 2 floor length skirts (1 dress fabric, 1 net) both stitched to net trimmed bodice. Overskirt (also in net) is gathered at lower edges with bows. View 2 overskirt is contrast fabric with band tie-ends of dress fabric. Junior Miss Size 13; Bust 33; Waist 25.5; Hip 35. Pattern is uncut, complete and in original folds. Envelope has missing torn portion (on front only) as shown; repairs have been made with acid neutral archival document tape.